It is a cold, hard, immutable fact of life that any nation surrendering control over its monetary policy must therefore use fiscal means to solve its fiscal problems. However, Miguel Gomes simply cannot grasp this self-evident principle. Unfortunately, in this case ignorance does not produce great art. Instead, Gomes proves the folly of didacticism with his three-film cycle, Arabian Nights (trailer here), a haphazardly assembled grab bag of leftist tropes and half-baked literary archetypes that screens as three misguided Main Slate selections of the 53rd New York Film Festival. In his initial intertitles, Gomes warns us his Arabian Nights has nothing to do with the traditional Arabic folk tales, even though it appropriates the title, as well as the use of Scheherazade as the narrator. These are episodes of woe resulting from Portugal’s austerity policies, allegedly passed by “a government seemingly devoid of social justice.” Of course, the Greek Syriza government has social justice coming out of its nose, but they passed an even more stringent austerity package. That is what happens when you can no longer devalue your way out of debt. Be that as it so obviously is, Gomes is determined to score his ideological points as best he can. 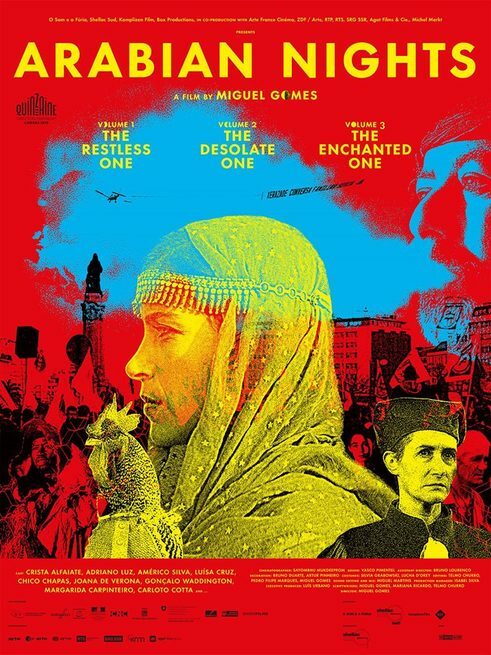 After a haltingly Godardian preamble in which Gomes literally runs away from the supposed ambition of his film(s), Scheherazade commences the motely tales of Arabian Nights: The Restless One. The first is a representationally inconsequential sketch about politicians and their erections. Gomes then segues into the meat of the film, “The Cockerel and the Fire,” one of the least political charged fables of the cycle. When an annoyingly shrill rooster is put on trial, a Dr. Doolittle-like judge is sent to hear his defense. It turns out, he is trying to warn people of future disaster resulting from a love triangle, which we then watch as a tale within the tale. In fact, the jealous lover’s morality play is reasonably diverting and incorporates texting in an unusual clever fashion. Sadly, the film loses all momentum with the didactic and repetitive “Magnificents,” in which a handful of structurally unemployed relief-seekers recount their sorrows in obsessive detail, before taking the plunge in a union-sponsored Polar Bear-style swim. Vol. 1 is a problematically mixed bag, but there are elements here and there that give cause for hope. Nonetheless, Arabian Nights: The Desolate One is basically more of the same, even starting with a jokey, slightly grotesque warm-up. However, Desolate’s centerpiece, “Tears of the Judge” is by far the high point of the entire pseudo-trilogy. It also features a genuine, engaging performance from Luisa Cruz as the judged tasked with getting to the bottom as an increasingly outlandish house-that-Jack-built chain of crimes. It would be a winner if Gomes had spliced it out and sent it into the world as a short. Unfortunately, Desolate peters out during “The Owners of Dixies,” a true shaggy dog story that shows initial promise but drags on interminably. Nonetheless, Desolate is easily the most watchable of the feature triptych, so it is not so random that Portugal chose it specifically as its official foreign language Oscar submission, at least if these were the only three films released in the country this year. Sadly though, all hope is quickly abandoned once Arabian Nights: The Enchanted One starts. Finally, Scheherazade appears in her own story, but it never really goes anywhere. Yet, it looks downright plotty compared to “The Inebriated Chorus of the Chaffinches,” a nearly eighty minute observational pseudo-documentary about rugged bird trappers. No, seriously. These rustic gentlemen might be fascinating, but Gomes shows little confidence in them. Instead of letting them speak on camera, everything is explained through Scheherazade’s on-screen text, making Enchanted a mighty chore to sit through. Let’s not mince words. I am here to tell you the emperor has no clothes. 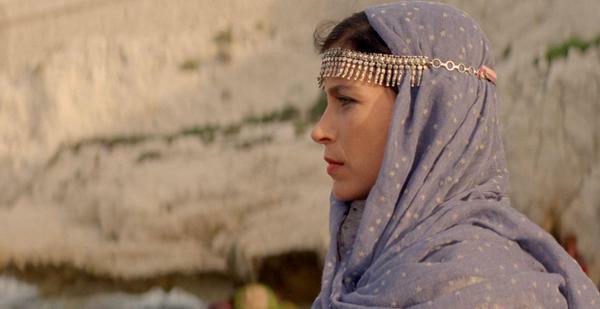 Gomes’ Arabian Nights has no business being at the New York Film Festival or any half-serious fest. 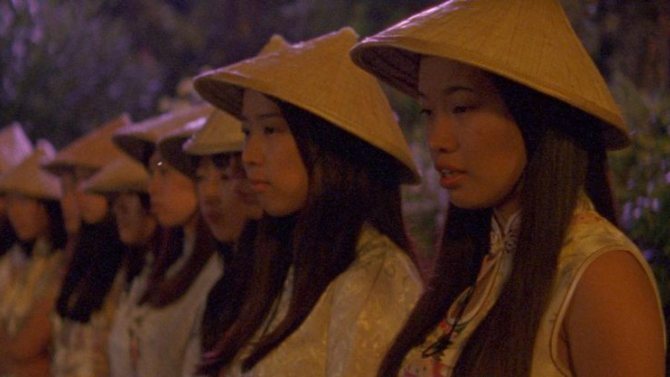 In any merit-based universe, it would be spell the end of Gomes as a filmmaker worthy of serious press attention, but critics have fallen in line behind it, intimidated by its leftist screeds. Nevertheless, as a viewing experience, it is sorely lacking. The narratives of the constituent stories are fragmentary at best, character development is almost nonexistent, and it all has a dingy, pedestrian visual style. Don’t buy the hype. There is no there there. The Enchanted One is so lifeless and contemptuous of the viewer’s time, it drags down the previous two installments in retrospect. If you are dead set on getting a taste of Arabian Nights it should absolutely, positively be The Desolate One, but even that is not worth any great effort. They certainly do not need to be seen in a block to inform each other. There are only a handful of call-backs throughout the entire cycle and they are each mere throwaways. None of them are really recommended, but The Enchanted One should be resolutely avoided. For those who need to take their penance, The Restless One screens this Wednesday (9/30) at the Walter Reade, followed by The Desolate One on Thursday (10/1), and The Enchanted One on Friday (10/2), as part of this year’s NYFF.